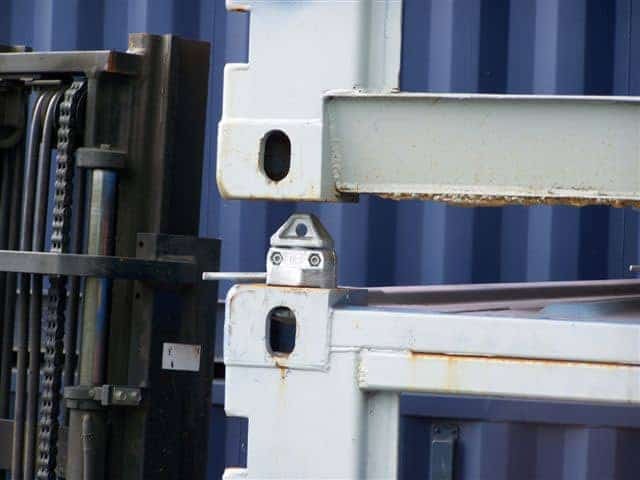 Twistlocks for shipping container stacking - See how and buy. How to safely stack your shipping containers with twistlocks. 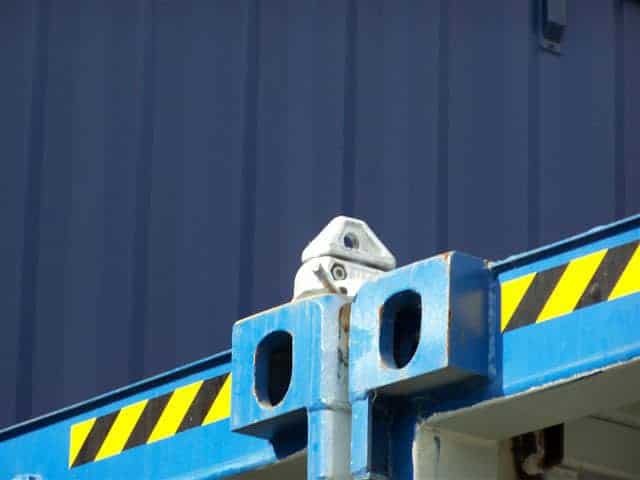 Shipping container twistlocks are an essential accessory if you want to be able to stack your containers safely. One of the great advantages of shipping containers is that by stacking them you’re able to free up more space at your property. However, unless you take proper measures it might be possible for the stacked containers to become dislodged (by strong winds for example). The inexpensve twistlock is an effective way of helping to prevent such problems. Fitting is easy, just connect a twistlock to each of the 4 corner castings of the container before stacking. As well as creating more space at your site you can now be confident that your containers are securely held together. Fit one twistlock to each of the 4 corner castings. 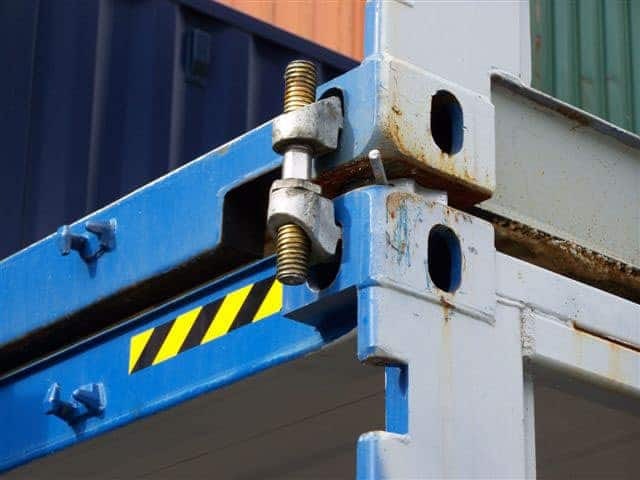 If you forgot to add container twistlocks then bridge clamps can be your saviour. 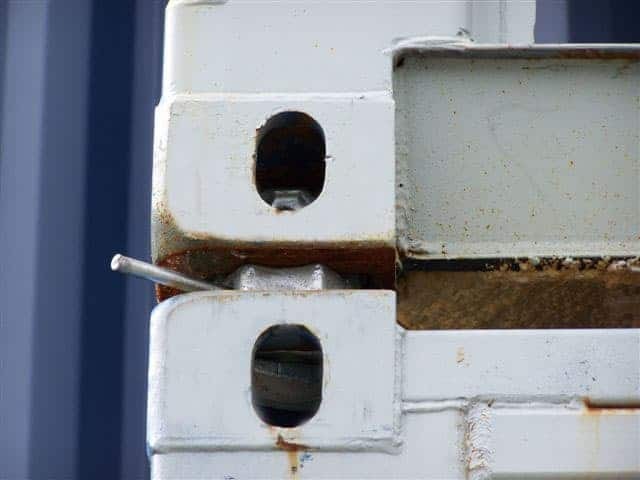 In case you already have the containers on site but forgot to order or install double headed twistlocks, don’t worry there’s a solution. You can add what are known as bridge clamps to secure the stacked boxes without the need to lift the containers again. You will however need to check from time to time that they remain tight, unless you use methods to lock the nut in place of course. Bridge clamp: An alternative to using twistlocks. Another method of securing the containers is welding the corner castings together on site. But this can be expensive to do under health and safety legislation as you might need access equipment and hot works certificates for example. Let us know how many shipping container twistlocks you need and we’ll put them inside your units before delivery, this way there are no extra delivery costs for you to pay. London, Felixstowe, Suffolk, Colchester, Essex, Grays, Gravesend, Kent, Barking, Southampton, Norfolk, Sussex, Bedfordshire, Birmingham, Cannock, Liverpool, Manchester, Leeds, Oxfordshire, Sussex, Coatbridge. Adaptainer © 2018. All Rights Reserved.